Darek was born prematurely in 1965. Darek Gabrynowicz: Because of premature birth I had cerebral palsy of the lower extremities. I spent all my childhood in hospitals, often far from home. I saw my parents and two sisters (Christina and Bogusia) as on holidays - every six months. I suffered muscle atrophy, spastic muscle paralysis, now I have reduced Achilles and leading tendons. Then in life there was a sport. - It was very difficult to cope with this, but I somehow managed to. In the fight against disease, sport always helped me. I swam, played football, table tennis, but all these sports did not absorb me the way it happened with armwrestling later. - After I accepted the treatment and returned to Lembork after graduation, I started working at the Disabled Cooperative. There I enrolled in the sports section, where I did a benchpress, played badminton and practiced other sports. There I met my wife Theresa, whom I later married. We have three children – Robert, Beata and Violetta. - My adventures in arm wrestling began in 2000. My friend Eligus Grotta came to me and invited me to take part in the first Zloty Tur in Gdynia in the club "TORNADO" in the category of disabled. I've never done armwrestling before. When I arrived at the Tornado, I was sure that I would take one of the last places. All the athletes were very well prepared for the competition. - After the first two fights, I felt morale. I noticed that I have a chance to win. Then I gave all 100% and took first place. I won the cup and 500 zł. I met Igor Mazurenko there, he told me that after this competition I can confidently represent Poland at the tenth European championship, which also was to take place in the club TORNADO. - I decided to participate in this championship, which also took place in 2000, and won two bronze medals in both hands in the OPEN category among disabled. Then I started to participate in small armwrestling tournaments that took place in Lembork. - The last competition, where I took part, was held in Jaworzno on 29-30.04.2006. 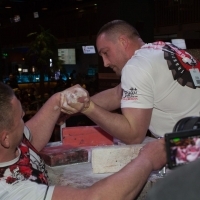 This was the sixth armwrestling championship in Poland. I finished third in both hands in the OPEN category. After that, I had to stop my sports career, because I had to support the family and children, and regular trips to the competitions heavily burdened the home budget. I also began to fight against diseases. I treated a huge wound on my left leg, which did not want to heal because of staphylococcus. Then the same appeared on the right. - At the same time, I had to start walking on crutches, because I could not stand and walk alone. I also had professional problems. I lost my job, later I opened a company that went bankrupt, and because of my disability, I could not find a job for two years. - After this time, fate smiled at me, and, at last, someone believed in my skills. The company WO-MAR gave me a job. When it was all right, I decided to return to my passion. My daughter took me to the 15th Polish Armwrestling Championships in Gdansk, which took place in 2015. I took the second place on my left hand and the third place on the right in the +90 kg category. After this victory, the fighting spirit woke up again, and I began to train. A year later I again competed in the Polish Championship, but I did not get a place on the podium. - After this defeat, I did not give up, on the contrary, I began to do more, I started on a diet. I refused meat, flour products and bread. I train four times a week (Monday, Tuesday, Thursday and Friday). I lost 17 kilograms. - In October of this year Pavel Podlewski called me. In a short conversation he told me that he had heard about my latest achievements and about returning to the sport. He invited me to pull at the World Cup. I was very surprised that after such a big break I was again called to the Polish team, and I would represent our country. But on the Cup I took the third place on the left hand and the second place on the right in the class of +90 kg. - I can assure you that this is not my last competition, and if health allows me, I will be engaged and take part in competitions because I love this sport. This is something that allows me to forget about my health problems, and I like this feeling when my relatives are proud of me when I get the podium. Darek, thank you for the interview! You reminded our young [and not only] sportsman, our history and a good piece of our sporting past. Darek Gabrynowicz: I would like to thank Pavel for offering me a performance at the World Cup, and Anna Mazurenko for an excellent preparation for the competition. In a year I will try to return to Lembork with gold medals, if I again will be invited to the Polish team to represent my homeland. Merry Christmas and Happy New Year all!